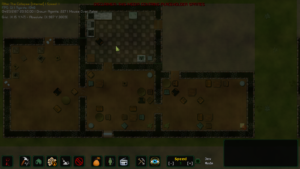 It’s time for our 10th After The Collapse devlog. But before we go over that, I’d like to thank Ranalcu for his donation. As stated a while back, donations aren’t necessary, but hey, it’s appreciated! 🙂 Anyway, there is a lot to go over. Agriculture is the big item in the room. 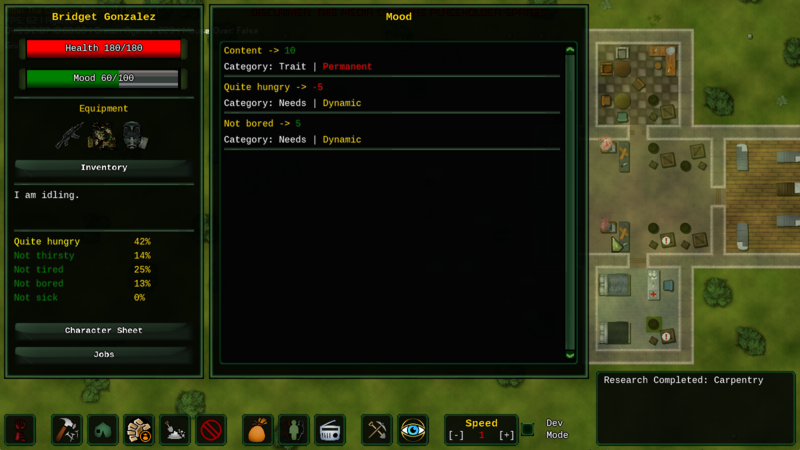 But a lot of work has also been done in other areas with a menu showing details about the settlers’ mood, a major upgrade to the trait system (which is kind of misnomer, as it’s used for injuries and sickness too). Map decay, for that post apocalypse feel. On screen filters, etc. Well, it’s now possible to setup farmlands. Setting up the farm is slow, each tile must be worked on for a few (in-game) hours to be converted into the appropriate terrain. Then seeds have to be planted, which also takes time. 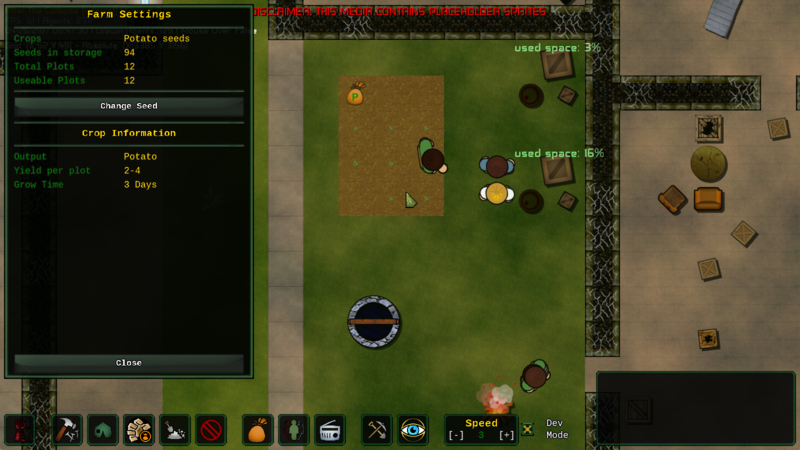 That done, each grow cycle is (for now) self sufficient, plants visually grow over time and can be gathered when done. 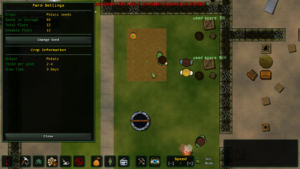 A farming skill has been added to settlers, which dramatically impacts how long it takes the prepare, plant, and gather operations. 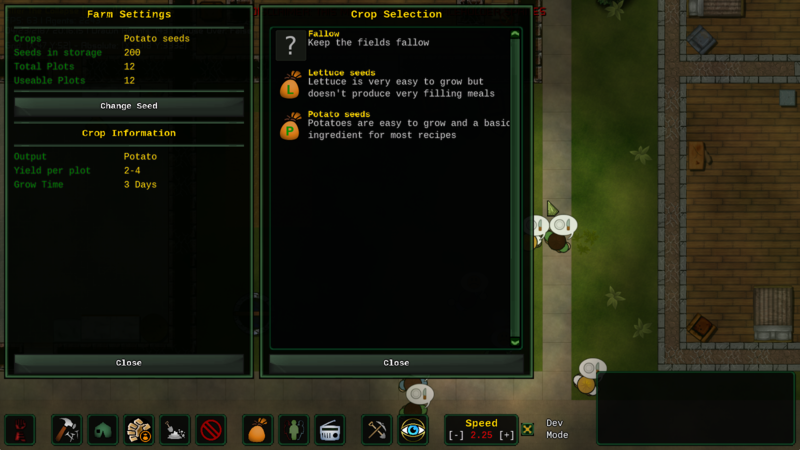 Raw plants (potatoes and salad for now) can then be used in food recipes at the kitchen. It’s a bit bare-bone, but it’s a simple and extensible system. 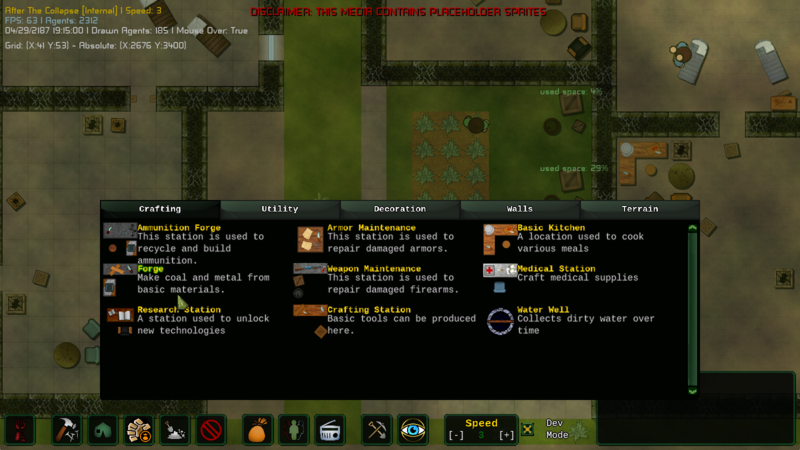 Things like water, pests and decay can and will be implemented during early access. Speaking of water, a new water well construction has been added, it slowly produce contaminated water. Water can be manually boiled at a camp fire at a 50% production rate. Technology and correct building materials will unlock better, automated systems. Settlers can drink both, however they aren’t stupid ans will only drink contaminated water when there’s absolutely nothing else available. Technically speaking, contamination is a tag that can be applied to any consumable item. 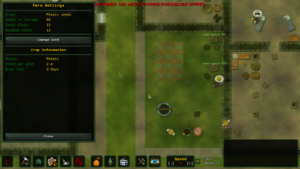 The downside of contaminated items is that they increase the “sickness” meter, which in turn increase the likelihood of a settler to become ill. 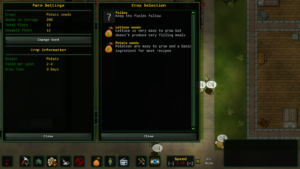 When weather patterns are implemented, more methods will be added for water collection. Right now my main issue with the whole food production is that it’s not extremely practical from a data point of view. 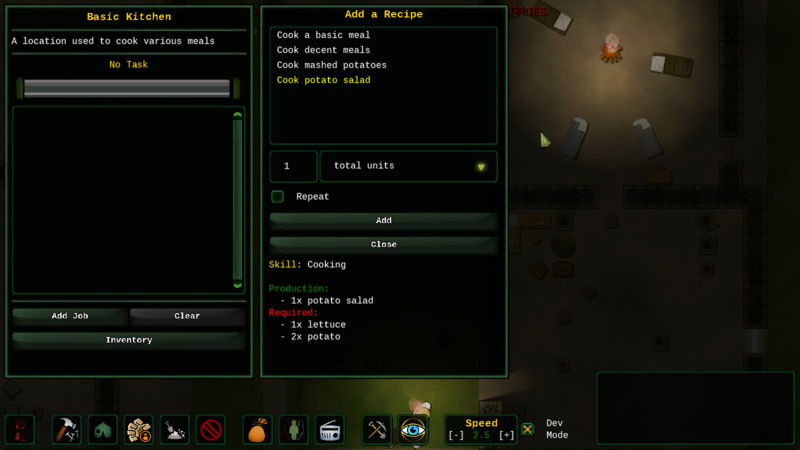 Individual food recipes are fine as long as we keep the number of ingredients low, but at some point or another we’ll have to switch to a more generic system like the one in place in Dwarf Fortress where food rations are made out of a semi random combination of ingredients and their nutrition value based on said elements. Should be interesting to write, but for now, the current system will suffice. 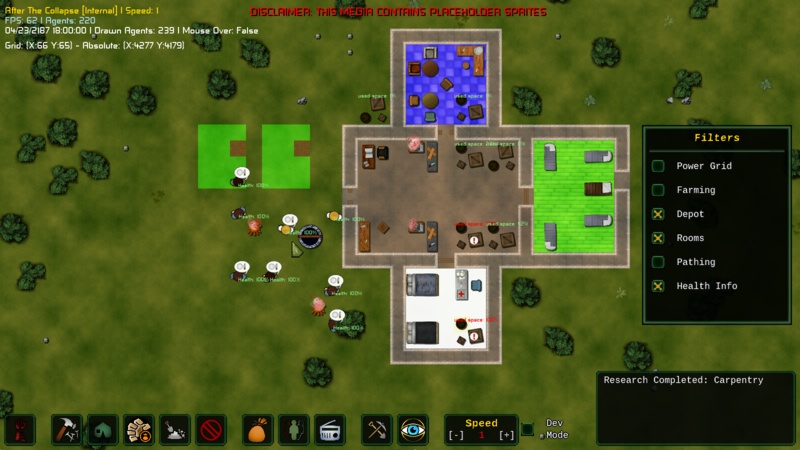 This part is very much in progress at the moment, but a way to handle illnesses and wounds has been implemented. It’s an extension of the trait system which allow some traits to last for a specific period of time. When that period ends, there’s an additional option giving them a chance to morph into another trait. 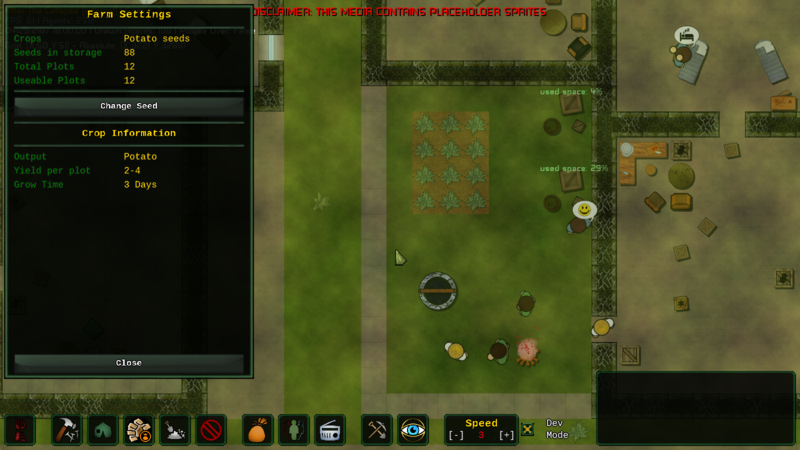 Let’s take an in-game example: the “bad cough” trait (slight reduction to social and endurance) lasts for 48 hours. After that, it has a low chance to either be replaced by “common cold” (benign) or “flu” (more annoying). While it’s not the case here, we can continue this chain of cascading effects for as long as we like. Same goes for wounds, a laceration will have a chance to get infected, and an infection will most likely lead to death if left untreated. 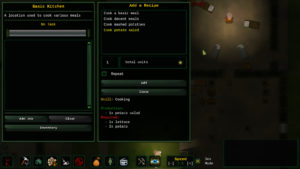 Of course, a medical station with appropriate recipes have been added too. While I’m far from done with the hospital proper (with beds and patient/doctor jobs) or health in general, far from it, I wasn’t planning on beginning until this month, so that premature progress was quite welcome. 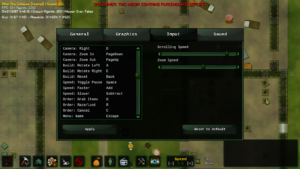 I added “filter” menu which allows the player to toggle on/off the rendering of rooms, health, the electricity grid, pathing, and individual storage information. More will be added whenever relevant. 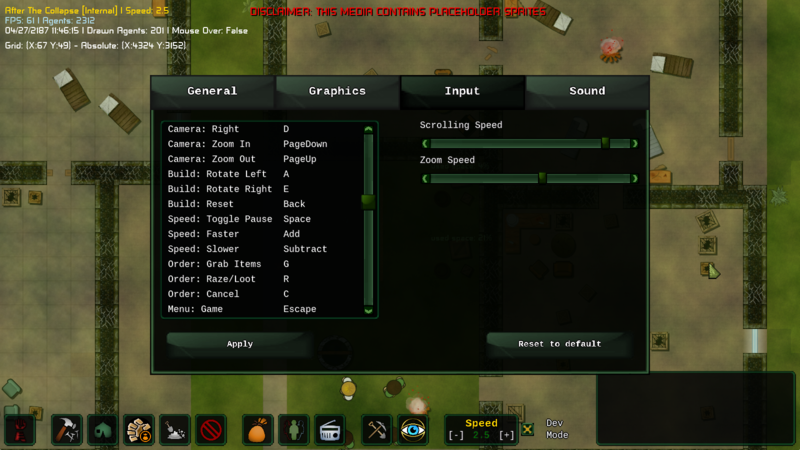 I also added an active pause, keyboard shortcuts for practically all the game’s functions, and a game log to keep the player informed of recent events (research done, settler dead, this kind of things). Globally, the user interface is getting there. The game log is quite bare-bone and taking too much real estate for something that’s only occasionally containing something, but that’s getting fixed soon. My only real worry is the population screen, as I’m not entirely sure how to design it for large amount of settlers yet. Well, it’s not so much a question of design as a question of performances and UI capabilities.. We’ll see. Multilingual support is also in place but I won’t remotely have the time to translate every single item, description, menu to other languages before the EA release. It wouldn’t have been of much use given that i’m constantly changing menus and descriptions. It’s better to wait for when things are a bit more stable. I finally added a menu detailing a survivor’s mood with each individual factor, their duration (if applicable), and description. Many more actions have an impact on mood. which is kinda paradoxical given the mood itself currently have next to no in-game impact. But that’s obviously going to change soon. Settlers now recognize when they are doing something in a room which doesn’t have the proper equipment. For instance, they won’t be happy to sleep in a bedroom in which you built a forge, or eat in a dining room without seats. Preliminary code to allow settlers to talk to one another is also being written, a way to store relations will likely follow soon after. 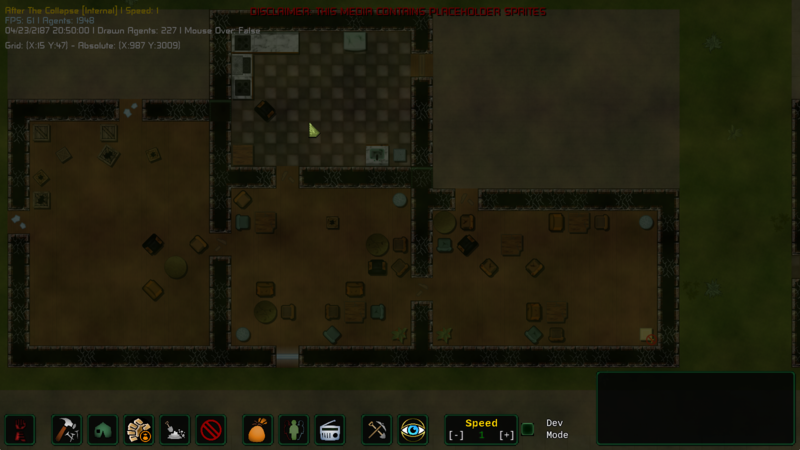 The map generator also got the ability to “decay” any building, damaging walls, replacing furniture by broken versions of those and generally reducing the amount of loot you’d get compared to a building that hasn’t been destroyed. 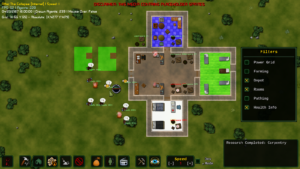 I’m probably forgetting a few additions, but there was also a big focus on stability, bug fixing, and stuff I don’t normally write about, as they are of little interest to the public but still need to be done. Not mentioning all the sprites and sound effects I had to add, make or modify. August is going to be difficult, there’s a LOT to do and we’re headed for record high temperatures over here which makes working next to an overheating PC quite difficult mentally. But, granted I don’t die from heatstroke, we should finish the hospital and health related stuff, which is the last big missing feature. That done, manual orders for combat, some basic weather system and finally an event system to trigger caravans, enemy raids and that kind of stuff. Not all of that will be done by the next devlog, but that’s the last set of things to complete before feeding the game with data, building a quick tutorial and getting ready for early access. After the Collapse [devlog#9] Power, storage and Science! YES! YES! I always loved the idea of Fine Minced Fly Brain, Fine Minced bluberry and Fine Minced Blueberry seeds cake! About difficulty, yes we’ll add difficulty settings. 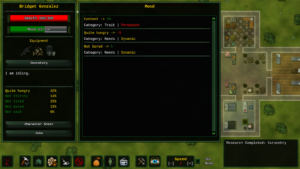 I’m writing an event manager which is not so different from rimworld’s storyteller system. 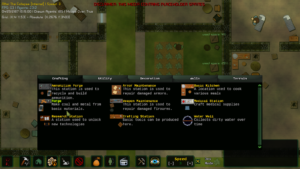 As such it will be pretty easy for me to add/remove the most difficult events and/or disable raids altogether.